I have made a bench power supply that can erogate 0-30 volt and 0-2 A. 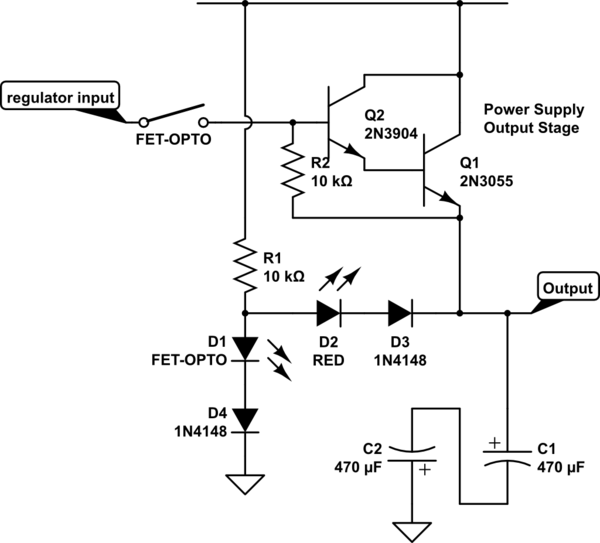 Now, how can i protect my bench power supply from reversed voltage applied to it's output? I am thinking to create a separate circuit with a separate floating ground to sense a reverse voltage applied to the output of the power supply, but i am looking for an easier way to do it! A diode, in antiparallel, and a fuse would do the job, but i am looking for something more reliable! I think your floating ground approach may be a nice simple way, as it lends itself to being an external add-on to any power supply, and especially battery chargers. This arrangement doesn't draw any current from the battery except when there is a negative input < -0.6V. So 2 or 3 tiny lithium coin cells, and it will run for ever. When the output goes below the negative lead by 0.6V, Q1 turns on, and turns M1 off. R1, R2 values affect how abrupt the switch off is. R2 will set the load current when off. Fet should have very low R on, as it is outside the feedback loop. 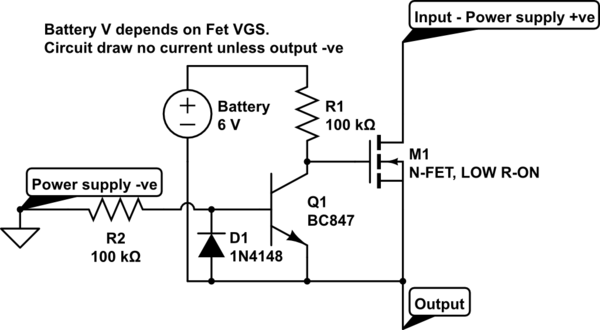 The battery voltage needed depends on VGS.sat of the FET. This is how I retrofitted an old bench supply that I need to tolerate reversed batteries connected to the output (without forcing current through them or having fuses/circuit breakers pop). A fet switch optocoupler controlled the drive to the output stage. Normally D1 is energised, and the output stage gets drive. When the output goes below 0, D2,D3 take the current from opto D1, disconnecting the drive to the output stage. D2 lights during reverse protection. D3 protects D2 from 30V- LED's don't have high reverse voltage rating. D4 can be 0-2 diodes to set the voltage around 0, where it cuts off. You need to watch for other components that might be affected. C1 is the usual electrolytic capacitor across the output. Adding C2 makes it bipolar, so -ve does not destroy it. However electros are not like diodes. They do not conduct reversed. On my supply C1 is a 63V electro. A 12V battery can be put reversed across the power supply. The 63V electro does not mind -12V :I did not need C2. Not the answer you're looking for? Browse other questions tagged power-supply power reverse or ask your own question. What circuit will allow reverse polarity and continue to work? USB & 12V-Power-Supply simultaneously - Diode? power supply remote sense protection resistor value?